Last week, Armani Rogers decorated this column and came through with 45.4 fantasy points for astute CFF owners, like myself, who started the Rebels’ quarterback. Shockingly, Rogers remains available in 63% of leagues on Fantrax. I am so bullish on the dual-threat signal caller that he makes the list again. In three games, the sophomore has totaled 11 touchdowns and rushed for over 300 yards. The Rebels travel to the Red Wolves and Vegas projects a high-scoring affair. I look for Rogers to easily eclipse 35 points this week. I am not trying to reinvent the wheel and immediately looked at projected game totals. The Owls versus Knights game on Friday evening leaped off the page. I want a piece of the action, and Chris Robison is undervalued and overlooked in the CFF community. He scored a season-best 41 points against Air Force two weeks ago. In the other two games, the opposition and/or game script limited Robison’s production. Not this Friday. The Owls are two-touchdown underdogs on the road, and Robison will be playing catchup in the fourth quarter against McKenzie Milton and the Knights. The freshman field general passes for over 300 yards and three touchdowns on Primetime. Who is Desmond Ridder? A 6-foot-4 and 212-pound, three-star recruit for the Bearcats. In the opening game of the season against UCLA, the freshman replaced Hayden Moore and now is the entrenched starter. In his first three games, Ridder has passed for 344 yards, scampered for 175 and produced five touchdowns. Against Alabama A&M, Ridder led Cincinnati to a school-record 741 yards. Coach Luke Fickell stated that “I think the unique thing is that Desmond has a lot of confidence in himself…You see it but you’re kind of curious until those lights come on and you get some of those opportunities.” CFF diehards are also inquisitive in regard to Ridder’s potential for the remainder of the season. The Bobcats rank dead last against the pass, surrendering 431 yards per game and allowing six touchdowns. Ridder produces another treasure-trove of points over the weekend. As a sophomore last year, Adrian Killins rushed for 790 yards, scored 10 touchdowns and grabbed 25 passes for 169 yards, earning First Team All-Conference honors. He is the anthesis of a volume back, manufacturing big points on limited touches. Killins might be the most underrated ball carrier in the nation. In 2018, he has scored three touchdowns on only seventeen carries. The Knights game breaker averages 7.5 yards per carry and 16.3 yards per reception. Against UConn and South Carolina State, Central Florida overwhelmed both teams, which limited Killins touches. The Knights face a much tougher opponents in the Owls, and the game should be closer in the second half. The game script foreshadows a season-high snaps and touches for Killins. If available, grab the UCF star and place the electric playmaker into lineups. I will be called a homer for this selection; nevertheless, please hear me out. Coach Randy Edsall enjoyed his most successful campaigns at Storrs when the defense played well and the running game dominated opponents. Both Donald Brown and Jordan Todman became CFF stalwarts in Edsall’s offense. It has taken a while, but UConn may have finally found their top dog in the backfield. Kevin Mensah rambled for 144 yards against Rhode Island last week and has garnered over twenty carries twice this season. He has also averaged 5.2 yards per carry and scored two times. When the Huskies are in the red zone, the Orange must respect QB David Pindell’s running ability, and Mensah will surely see open lanes to the goal line. Lots of points will be scored, and the UConn ball carrier reaches the promised land twice. A tale of two games for Trey Ragas to open the 2018 campaign: He rushed for 142 yards versus Grambling in the opener, but only 49 yards last week against Mississippi State. It will be much easier sledding for Ragas against Coastal Carolina. The Chanticleers rank #100 in Total Defense, permitting 31.3 ppg. and 212.3 rushing yards per game. At 5-foot-11 and 227 pounds, the Ragin’ Cajuns ball carrier employs good power and runs through contact. A patient runner, he displays a strong jump cut and makes defenders miss in tight quarters. Coastal Carolina will have a difficult challenge slowing down Ragas and the ground game. The redshirt sophomore easily surpasses 150 yards rushing while crossing the finish line twice. In the rivalry between Oklahoma State and Texas Tech, the Cowboys have won nine consecutive games, and the two teams have combined for an average of 90.6 points over the last five contests. Neither defense can stop the other team’s offense. Yum! QB Taylor Cornelius has taken over the reins of the aerial attack, and the Cowboys are flying high. Tylan Wallace has become one of the better receivers in the Big 12. He has recorded back-to-back games with over 100 yards, snatching 15 passes for 271 yards and a touchdown. For the season, he has totaled 19 catches for 391 yards and two touchdowns. Look for Wallace to eclipse the century mark for a third consecutive game on Saturday. 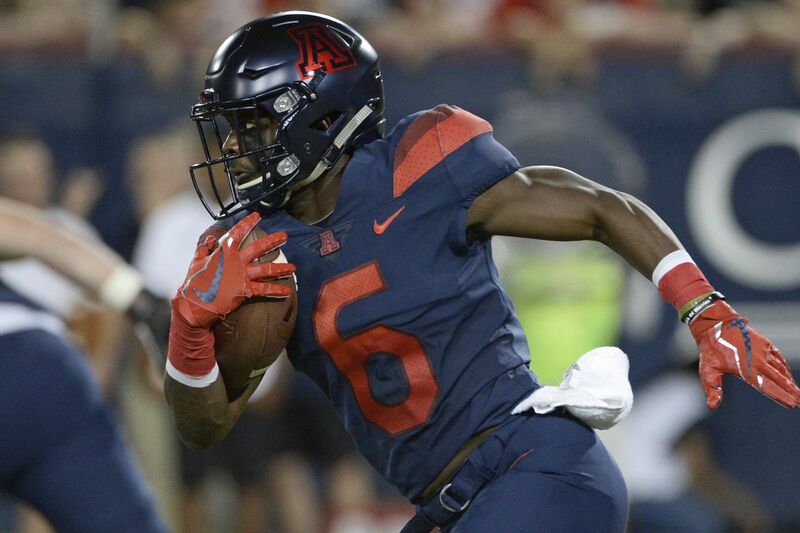 Quarterback Khalil Tate frustrated CFF diehards the first two weeks of the season as the Wildcats lost both games under new coach Kevin Sumlin. Luckily, Arizona faced FCS-opponent Southern Utah and the aerial attack soared in a 62-31 victory. Shun Brown has quietly been productive over the past two outings: He has 14 catches for 170 yards and two touchdowns. Against the Thunderbirds, the Senior played so well that PFF graded Brown as the best receiver in the PAC 12 last week. Neither defense can stop the opposition and both clubs are likely to produce five touchdowns. Brown is available across the hobby and well worth picking up and inserting into lineups this week. The Eagles recruited Jeff Smith as a dual-threat quarterback, and he played in nine games as a true freshman. In 2015, he carried the football 71 times for 450 yards and scored six touchdowns. Smith eventually transitioned to become an all-purpose wide receiver. Last year, he finished third on the team with 25 catches for 296 yards. Before the season opened, Smith had only 53 career receptions. Last week versus Wake Forest, the Senior exploded with six receptions for 145 yards and two touchdowns. He also ran three jet sweeps for 42 yards. At 6-foot-1 and 195 pounds, Smith should continue to shine against Purdue on Saturday. The Boilermakers rank among the bottom ten teams against the pass and must account for running back A.J. Dillon in the backfield. Smith gets open deep behind the secondary and scores from beyond 50 yards again.